Description: "This handsome, grinning man has the furry legs of a goat and a set of curling ram horns extending from his temples." Their bodies are a memorable combination of well-shaped human torsos perched upon powerful, cloven-hoofed goat legs. Large, curving ram horns adorn the sides of their rugged faces, and unkempt tangles of fur enhance their sinewy muscles. They emit the dank, earthy smells of sweat, soil, and exertion. Information: Satyrs are debauched and hedonistic creatures of the deepest, most primeval parts of the woods. Known for their insatiable carnal appetites, satyrs are the epitome of virility and sensuality. They are commonly associated with bouts of drinking, wild music, feasting, and sexual congress. Their powers of seduction are legendary, wooing unwary maidens and shepherd boys and leaving a trail of awkward explanations and unplanned pregnancies in their wakes. Though their upper bodies are almost always those of attractive and well-built men and women, much of the satyrs' talent for seduction lies in their talent for music. With the aid of his eponymous pipes, a satyr is capable of weaving a wide variety of melodic spells designed to enchant others and bring them in line with their capricious desires. 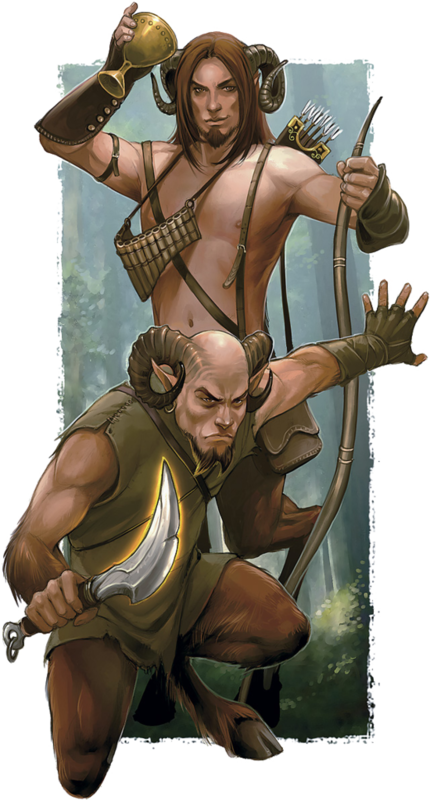 In addition to their constant frolicking, satyrs often act as guardians of the creatures in their forest homes, and any who manage to turn the satyr’s lust to wrath are likely to find themselves facing down dangerous animals surrounding the angered fey. Still, while satyrs tend to value their own amusement well above the rights of others, they bear no ill will toward those they seduce. A satyr is far more likely to be carrying musical instruments or bottles of wine than weapons. For the most part, satyrs leave travelers in peace, though if there's someone the satyr takes a shine to it's not unknown for a non-violent "encounter" or two to take place. They are, however, more than a little mischievous, and often seek fun at the expense of those who seem to deserve it. Unlike many other fey, satyrs are not in the least bit territorial. On the contrary, they prefer locations that attract a variety of other fey, animals, and consorts. Also, while many fey are bound to their habitats, satyrs are prone to wandering. Once a satyr has sated himself on the local offerings, he abandons even perfectly suitable sites in search of greater stimulation. Many compare them to traveling minstrels, not only for their musical talent, but also for their tendency to meander from place to place, leaving a string of awkward conversations in their wakes. For the most part, satyrs' merry company and musical skill make local inhabitants willing to share their patch of forest. Unfortunately for besotted lovers, tender moments rarely translate into lasting relationships. Satyrs are in love with the new and uninterested in entanglements, and once they have attained their goal, they are quickly lured away by the thrill of the next conquest. Far from being one-dimensional, satyrs are also known for their innate magical and musical talents. They are able to use the otherworldly music from their distinctive panpipes as a conduit for their magical powers, changing the melodies in order to influence creatures in a variety of ways. While most satyrs know a handful of traditional illusion and conjuration magics, they are best known for their potent compulsions. Some older satyrs can produce a wide range of magical effects; however, the vast majority of these fey limit their repertoire to melodies that can either avert combat or ingratiate them with strangers.